There has been a lot of talk this year about how quickly autonomous driving is changing passenger vehicles. Be it in autonomous taxi services or improving driver safety. Either way, the industry is starting to garner a lot of hype. But what about autonomous trucking? This area isn't getting as much attention, particularly given how self-driving solutions could make trucking more efficient. It could also disrupt plenty of jobs in the process. Generally speaking, the consensus for autonomous trucking at this point involves fleet management (or platooning). In other words, there is a lead truck controlled by a human, while one or more autonomously controlled trucks follow behind. On paper this makes a lot of sense, given that many trucks spend a bulk of their time chewing up highway miles. For those that follow along with autonomous driving literature, they know that highway driving is a much easier feat to tackle than city driving, as there are far less situations that the vehicle encounters. Following a lead vehicle with the help of near-field communications and various autonomous applications makes the task even easier. According to a recent study by Goldman Sachs, they suggest that near "peak" autonomous driving, it could eliminate up to 25,000 trucking jobs per month, or roughly 300,000 annually. 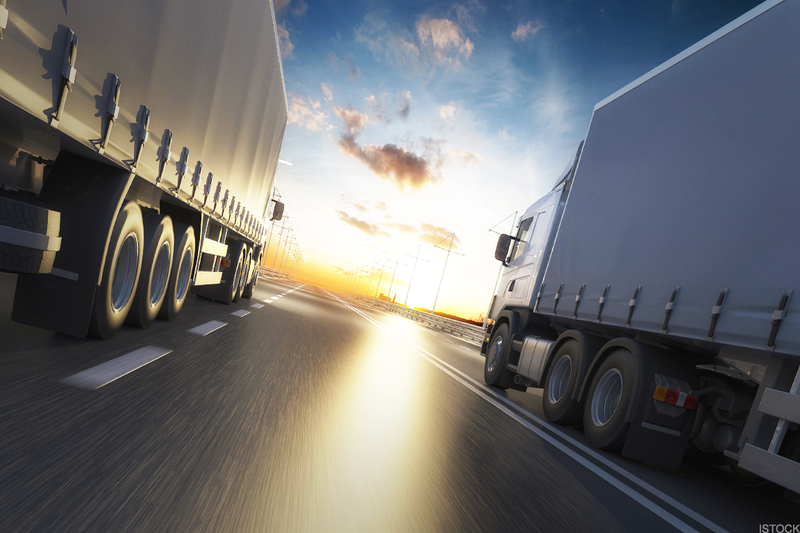 Currently there are about 3.5 million truck drivers in the U.S., so this is no small figure. Frequent readers of TheStreet know that Anders Keitz has been all over the trucker shortage within the country. Last month, she reported that the shortage stood between 60,000 and 100,000 drivers, a figure that could triple by 2026. That's about eight years from now, which means that partial or full autonomous driving solutions could alleviate some of that shortage. But it's simply too early to say given how quickly the industry is developing. While a loss of jobs would be disappointing, keep in mind these systems will not likely be operating on their own. They will need all sorts of staff to be involved in the logistics process, between navigating, planning and monitoring these systems. Uber recently said it would shift its focus from autonomous trucking to focus on autonomous driving. That's despite its more than $600 million purchase of Otto, a self-driving trucking company. But that doesn't mean the industry has no promise. Consider that Uber's largest business is its ride-hailing service, not Uber Freight (which they are not shuttering, by the way). By focusing on creating autonomous taxi services, Uber can remove its largest cost (the driver) and focus on driving profits in its largest markets. Given that autonomous trucking is both a smaller market for Uber right now and further off than autonomously driven passenger cars, the decision makes sense -- and doesn't make trucking dead. Who else can benefit? Given that Ford Motor Co (F - Get Report) , General Motors Co. (GM - Get Report) , Fiat (FCAU - Get Report) and many others do not participate in commercial trucking solutions, that would seemingly eliminate them. However, keep in mind they do offer cargo, transit and work vans that could benefit from autonomous trucking. Further, if Fiat is paired with Alphabet (GOOGL - Get Report) (GOOG - Get Report) and its Waymo software, while GM and Ford roll out other autonomous transport services, they could benefit from autonomous trucking, albeit on a smaller scale than semi trucks. Tesla (TSLA - Get Report) is working to develop its semi truck and already has its Autopilot service, so it would be thought of as a natural (albeit early pick) to don the autonomous trucking crown. That said, companies from Werner (WERN - Get Report) to Swift (SWFT to United Postal Service (UPS - Get Report) and FedEx (FDX - Get Report) could benefit from autonomous-trucking efficiencies. A recent discussion with Doug Mehl, a partner at consulting firm A.T. Kearney who works with automotive supply companies, also lent a hand at the potential winners. Speaking broadly about the auto industry's peaks and troughs, he said the suppliers that are best positioned are those focusing on the future of driving. So while Mehl was not speaking on autonomous trucking specifically, it's not irrational to think of certain OEMs and presumably logistics software companies positioning for autonomous trucking as potential winners either. With that in mind, there are a lot of potential winners in autonomous trucking and perhaps several losers as well.